I seasoned and floured some the pork liver. I then gave it a quick sear. Took out and added a sliced onion and cooked down. 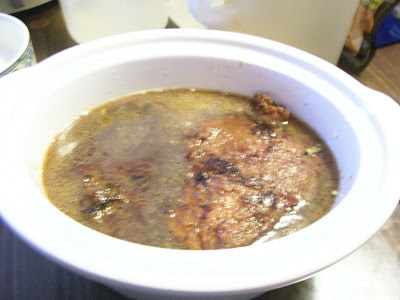 Then added the liver back with some beef stock covered and simmered on low for about 15 minutes. Took the cover off and let some of the water evaporate. 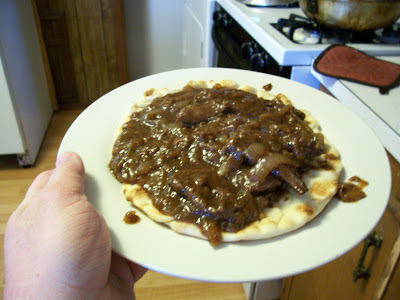 Served it over Toufayan Flat Bread. The pork liver has a slightly more liver taste and was firmer than cow's liver but since I love liver in any form I found quite good. I think with the next batch I will make a pate. This is what they call a shared appetizer. 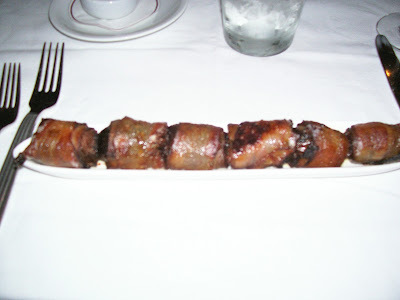 The sausage stuffed bacon wrapped dates were my favorite last night. They were smoky, sweet, and spicy. A combo I particularly like. To my knowledge it has been on the menu for at least 4 years and deserves to stay there. It is a great aperitif to stimulate the appetite. 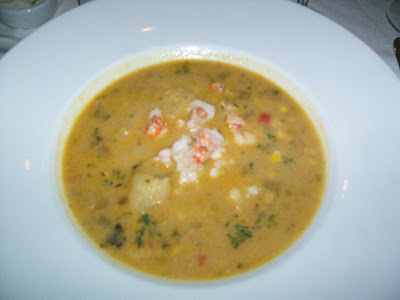 A corn and rock shrimp chowder followed. It is well prepared and the shrimp very good but I had two personal qualms about it. To me the potatoes could have been cut a little smaller to the size of the shrimp. Putting a big piece of potato in my mouth threw me off. 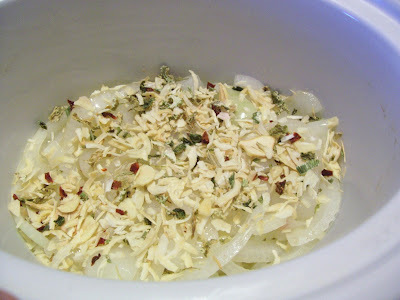 Another was a predominant herb flavor that overwhelmed the dish. I could not figure out what it was. It could have been sage or just too much bay leave. Whatever it was I did not care for it particularly. Finally some small cookies (lemon bars, in house oreos, chocolate chip, raspberry thumbprints, and sandtarts) served with Schraffenberger dipping chocolate. A very nice end to the meal and another example of the service. 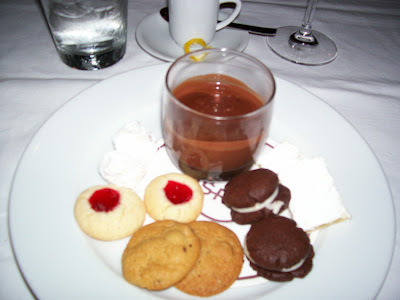 This was not on the dessert menu but rather a dessert offered with a three course meal offered that night. This had caught my eye and I asked if I could get it and they obliged me. Tonight should be another taste adventure and I will post that tomorrow morning. After a 2 hour stint at the restaurant to set up my work so my boss could do it I went to Lagniappe to get my bowl of hog insides. As usually it was very good but took quite a while to fix. The owner who I have come to know comp it because of that. It has been slow for them last week. They really put out a great plate lunch. Although it is not in the convenient location (off I-10 at the truck stop casino) it is well worth the effort to get to. Support your local restaurants. Went to Freys in Jennings last night. Did not realize it was homecoming and the place was packed. 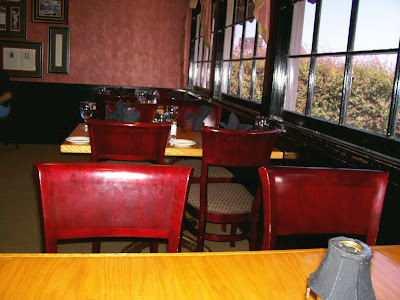 However they were very efficient and we did not have to wait for more than 10 or 15 minutes for a table. 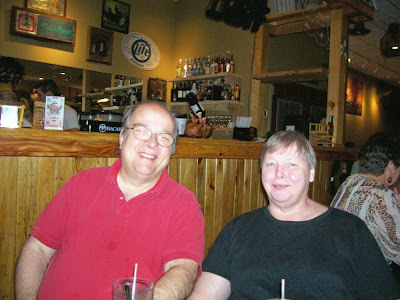 Joining me were a couple ,The Engineer and Towanda, new friends and dinning companions. A cup of chicken and sausage enj0yed by my enthusiastic friend. My taste proved very good indeed. 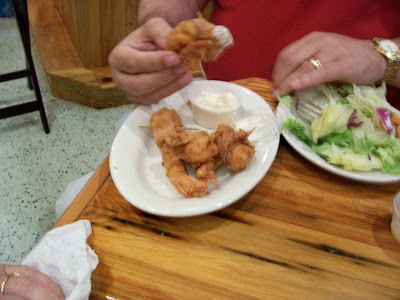 Towanda's Fried Seafood Kabob. 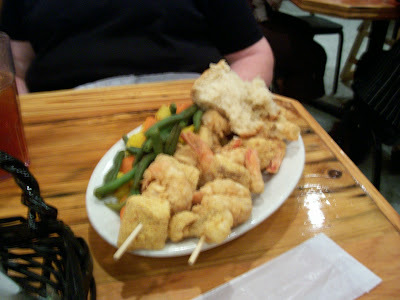 Fried jumbo shrimp and huge pieces of catfish fried to perfection and skewered with steamed vegetables. A real taste treat that I had gotten before. This was the Crabcake Pasta that my enthusiastic friend ordered. 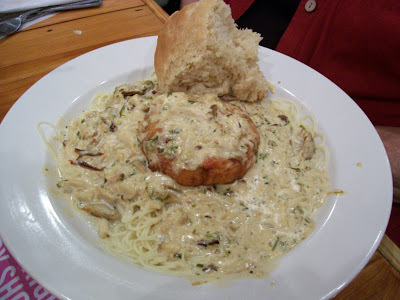 Nice crab cake served over fettuccine with a creamy spicy sauce. 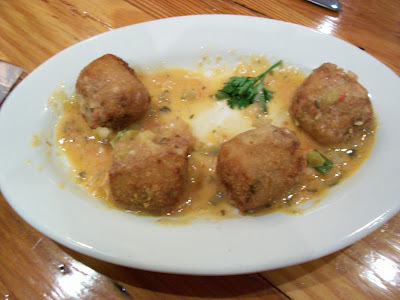 Besides a questionable texture on the stuffed gator balls everything last night was a winner. This venue puts out quintessential southwest La cooking in my opinion and well worth the 30 minute drive to get there. 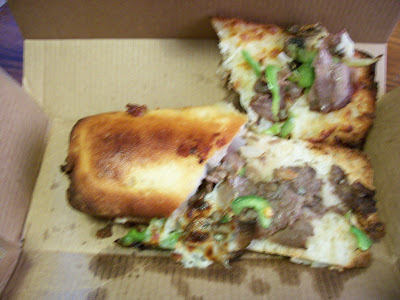 Lunch today did away with the last of the cheek meat debris. Open faced sandwiches with Mexican cheese on ciabatta rolls. 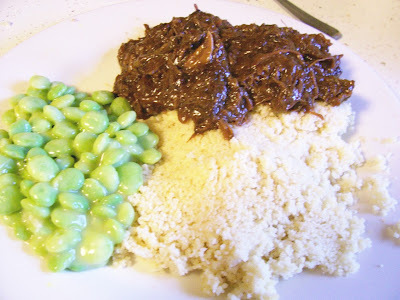 I have pretty much decided that the package of beef cheeks in the freezer is going this route also. It was too delicious to think of doing it any other way. I worked on my mystery package from the hog labeled pork insides today also. In it was the tongue, kidneys, spleen, and what I took to be the melt. I also defrosted the liver. 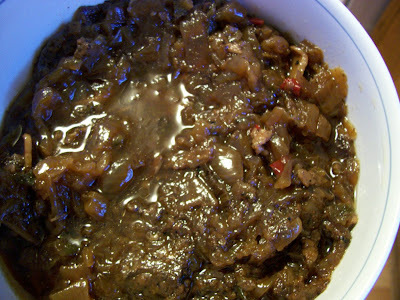 I sliced the liver thin and will cook it with loads of onions. I have never had pork liver cooked like beef liver before. This may prove interesting. I may make pate with some of it. The tongue will be my first experiment with my new pressure cooker. All the other stuff I cut into bit size pieces and will cook on top of the stove like my mother used to cook cow bouie. I will bring you updates and possible pictures as I do them. Ok this is probably a first for me. I am posting without any food pictures. This evening I went to Kyoto for sushi with my niece, Li Ahn, and her sister, Kim Ahn. Li Ahn is on the left. We had an assortment of rolls, sushi, sashimi, pot stickers and such. I rarely get to visit with her so taking pictures of the food totally went out of my head. We had such a nice visit that it does not matter to me that I did not take pictures. This place has decent sushi and I will be back. It is on my side of town. I am officially on my week vacation that I have taken off for my birthday. I usually eat my way through some city mostly New Orleans but this year it will be my own city Lake Charles. I will be doing the low end and the high end of the town. Join me on my journey through next week. I start on the low in. 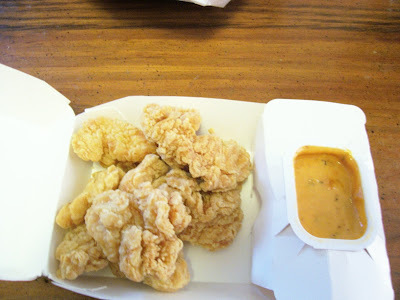 After grocery shopping I stopped off at Church's Fried Chicken because it was on the way back home, it has a drive-thru window and I had a coupon. 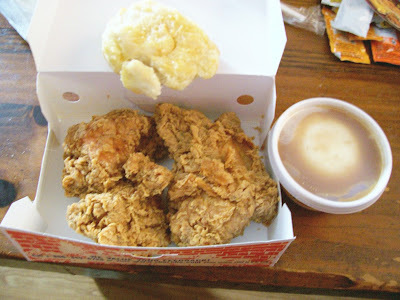 I tried their new Spicy Chicken. 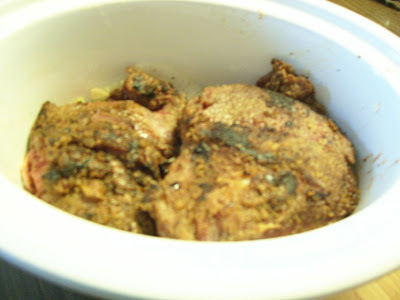 It is marinated in jalapeno, cayenne, red, black, and white pepper. It is then flour coated and fried. I do like chicken in flour coating. The spice level here was not overpowering but it provide a nice kick that lingered for a while afterwards. 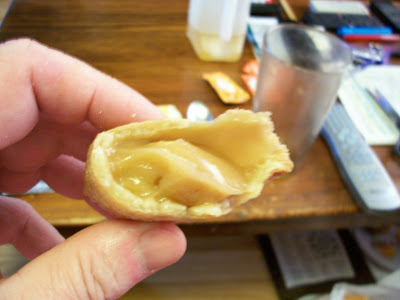 The biscuit with the honey butter coating is nice also. Mashed potatoes obviously prefab. If a coupon comes my way again I will get some more. This establishment is also a work in progress. At first it was more convenience story that a place to eat, now more restaurant than convenience store. Only the reach-in cooler for soft drinks and beer remain with some snack items. The rest of the floor space is covered with tables and chairs. 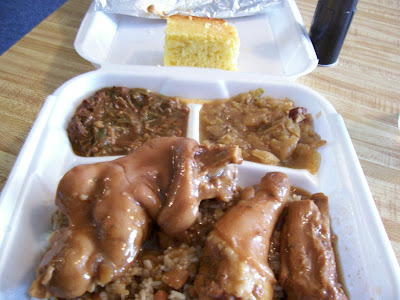 They serve a Cajun/Creole/Soul food type of plate lunch. Most come and take away although some like me stay to eat. Nothing fancy here, you eat out of the Styrofoam clamshell with plastic utensils even at night. They have fountain drinks or you can pull a beverage from a cooler. They also stock Anna’s Pies for those with a sweet tooth. First foray was a Thursday, which is Baked Pork Chop day. 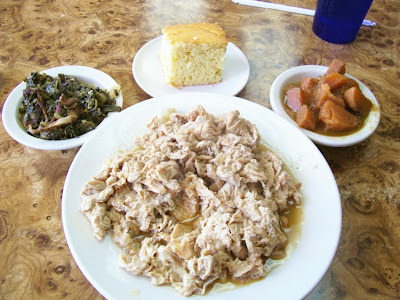 I received a thin breakfast style pork chop, greens, corn, and red beans and sausage over rice. The chop was nicely spiced and for the most part tender and moist. The corn possessed a sweet undertone and the greens smoky with lots of garlic. Unfortunately the red beans were under cooked as far as I was concerned. Good flavor though. Friday is Seafood Day for lunch. I got the Fried Catfish, corn, and potato salad with Shrimp Creole over rice. 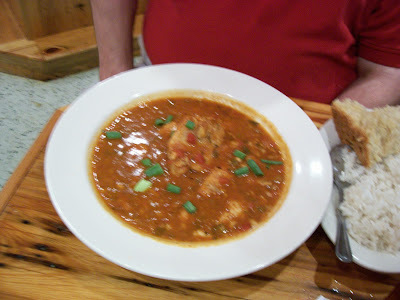 They also offered Crawfish Etouffee but since it was a red etouffee I declined. 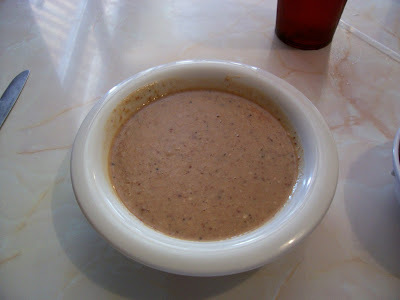 The Creole had nice tomato gravy with chunks of tomato, celery, and onion. 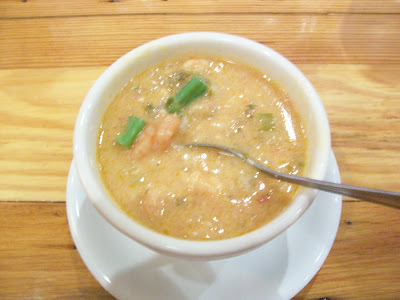 The medium shrimp in it were tender and not overcooked. It possessed a decent spice level. You got at least a dozen shrimp. The corn again good and the potato salad “mashed potato style’ and delicious with sweet relish and boiled eggs. The huge catfish fillet was crispy outside and moist inside but not wet. A very large lunch meant for a working man. The owners of this place are Indians and on the weekend they get in the kitchen and whip up some homestyle cooking. One night I got a combo Shrimp/Crawfish curry (tomato and onion sauce with a medium heat level), a cabbage, carrot and potato side infused with turmeric, a spinach and cheese samosa (fried dumpling), papadum (lentil cracker) and naan (bread). The naan was a little rubbery but the rest fantastic. A medium heat with the taste of East Asian spices. On two separate occasions I partook of lamb curry and goat curry. On both occasion my dinning companions expressed fully approval and appreciation of the meal. The side this time was stewed bell pepper and potatoes and potato and pea samosa with a tortilla subbing for Roti (another type of Indian bread). The meat was tender and falling off the bone with not a trace of any gamy taste. Partially because of the spices, cooking method and the youth of the animals. Again a medium spice level and the wonderful flavor of India. At this point they are just trying out various dishes to see the response not only to the dishes but the concept of serving Indian food. I gather it has been favorable as I heard talk of expanding the menu and days. So if you want a full fledge Indian in town, get over to this venue on Friday and Saturday nights to support and encourage them. This long time Baton Rouge restaurant has peaked my curiosity for quite awhile. 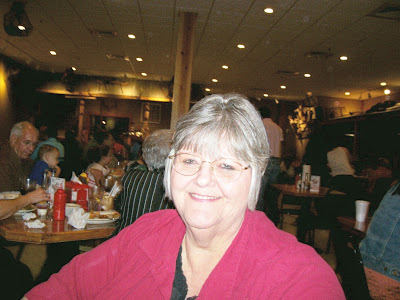 However since I am hardly ever in the area at dinnertime, I never had the pleasure of eating there. 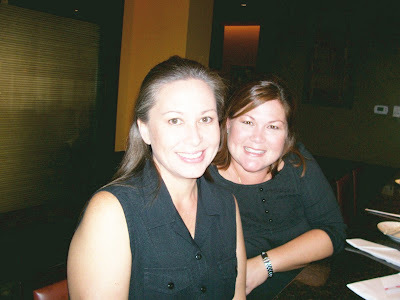 However recently they opened for lunch and a fellow worker and me were in Baton Rouge on business. Therefore we took advantage of the newly instituted lunchtime. Situated in a strip mall on Perkins the exterior is pretty mundane. However once through some iron gates you enter a sumptuous patio, which merely hints at the interior, first class all the way. They started us off with a plate of Sweet Potato Chips sprinkled with confectioner’s sugar, crisp and tasty. 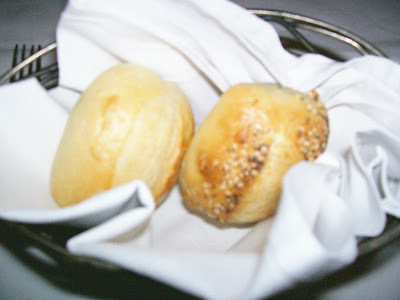 However the breadbasket brought what I consider substandard rolls. 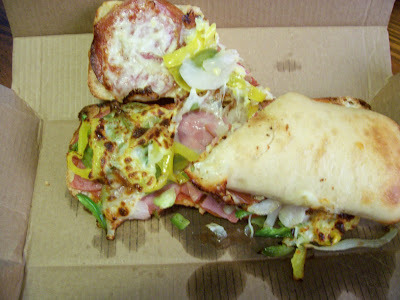 Possessing no crust and a sliced white bread texture inside. 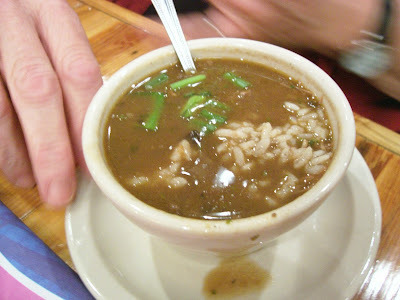 My companion ordered Juban’s Gumbo, which contained smoked chicken, roasted duck and andouille sausage. Like most Creole gumbos a bit thick for my taste but that bowl held wonderful flavor (smoky, spicy, rich broth with a touch of tomato). I opted for the Oyster Carousel. A trio of baked oysters in metal souffle cups. Along with the traditional Rockefeller (creamy spinach with bacon) and Bienville (cream sauce with breadcrumb top) was their Maxwell (horseradish cocktail sauce with sliced fresh Jalapenos). All were delicious with the Maxwell delivering a huge spice kick. Next came a side salad of various greens, shaved Romano, and crushed garlic vinaigrette, quite different but well suited for my taste buds. My companion opted for the Seafood Special of the day, BBQ Shrimp. Six jumbo shrimp peeled but tail on baked in BBQ butter and served with Garlic Cheese Grits with a sauteed medley of vegetables. My taste revealed well cooked but bland shrimp with killer grits, loads of cheesy garlic goodness. I had the Hallelujah Crab. A crispy flash fried soft-shell crab stuffed with shrimp, crawfish, and crabmeat topped with a Creolaise sauce (Creole mustard hollandaise). The stuffing was the size of my fish and in the carapace so the crab sat upright. Fried so it claws were in a “praise the lord” posture, it made for a wonderful plate presentation. Rice pilaf and steamed green beans and broccoli accompanied it. 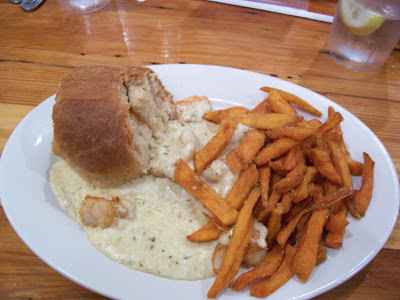 The sweetness of the crab and other seafood was complimented by the mustardy tang of the sauce, a perfect combo. Service was excellent and unrushed. The server was very informative and seemed to know about dishes and preparations. I would expect nothing less from an establishment of this caliber. I highly recommend it. This is something I do on a fairly regular basis. 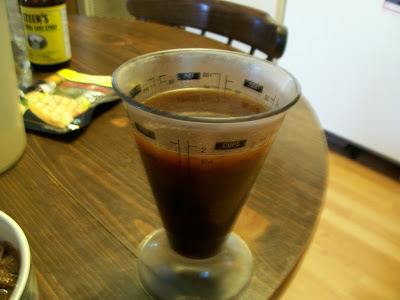 It really has no recipe just depends on what I have although I do not do if I do not have certain items. It is not picture worthy but delicious. This Sunday it went like this. About a tablespoon of lard (rendered by my cousin making cracklins from our pig. 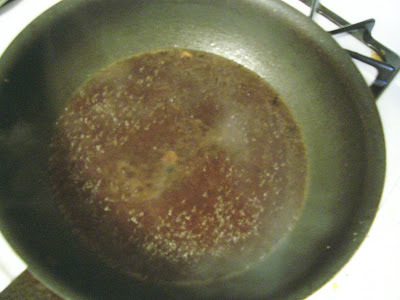 I usually render two thick slices of bacon) heated in a skillet. I added three 5" corn tortillas cut into strips and about 2 oz of smoked brisket bruniosed. 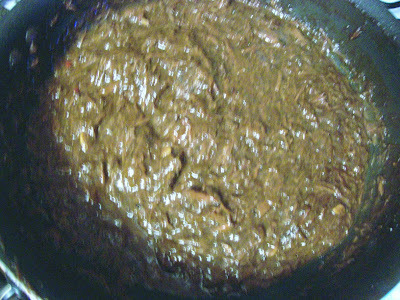 While those crisped up I whisked up 3 eggs, 1 tbs of nuoc cham, 1 tsp of chipotle paste, 1 tbs of dehydrated trinity with garlic, 2 sun dried tomatoes julienned, and about 1/2 cup of taco blend cheese. When satisfied the strips were crispy, put the egg mixture into the pan and scrambled them until still wet but ready to go dry. Plated and put a tequila green chile salsa on it. I also made quesadillas with the debris cheek meat. 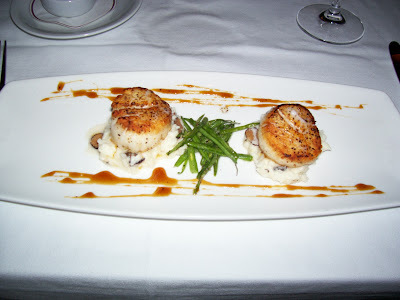 I am in a review deadline mode and have being going to restaurants that I am reviewing so little activity for the blog. 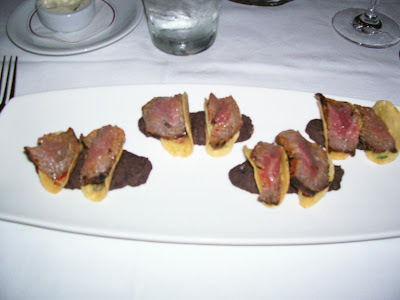 Wednesday I will be posting the reviews and pictures for the review that came out in Lagniappe last week. This raw beef cheek meat. 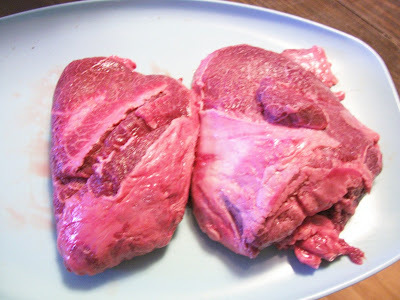 While it is not offal, it is considered variety meat. It actually comes from a cow's face and is the basically the muscle used to chew I think. 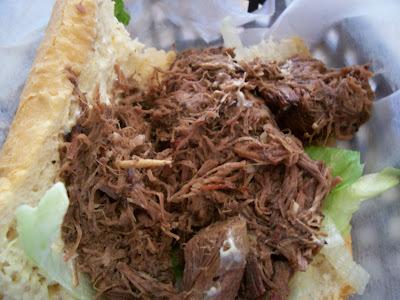 A hot idea in some New Orleans restaurant is pig or hog cheek meat. This meat contains a lot of collagen and certain amount of fat. 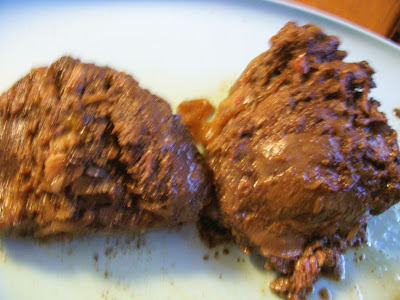 If braised properly it is the richest and beefiest piece of meat you will ever put in your mouth. I discovered it about 4 or 5 years ago. I get it when I can and it being so rich I cook it only a couple times a year. At this point in time you can find it at Kroger's on Hwy 14 or 12Th Street or most Wal-Marts. It is in with the heart, tongue and tripe. I usually do it "osso bucco" style with red wine and tomatoes. A recipe on the package sent me in another direction. I did not follow the recipe per se but it gave me ideas. The meals following the hunker down were simple and straightforward. An effort to bring the frig down to items that could survive for a few days. I had bought some frozen biscuits. A couple of them with butter and Steen's cane syrup along with my cafe au lait made up breakfast. With the rest I made sandwiches with some Eddy's smoked brisket one day and Rabideaux smoked venison sausage the other. Somewhere along the line I sauteed some sweetbreads. The power outage never came for me. I breathed a sigh of relief because if it had lasted more than three days I would have had to dispose of 100 lbs of hog meat. Following the current practice the bread basket is a metal basket. 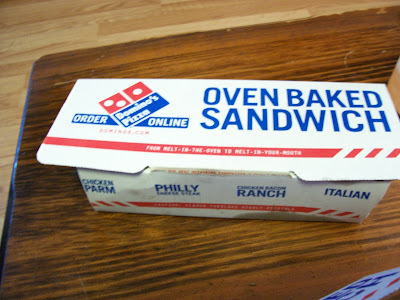 This contained rolls similar in taste and texture to the Outback. Rolled in oatmeal to give a rustic appearance they are still the slightly sweet artificially dark colored bread of the Outback. 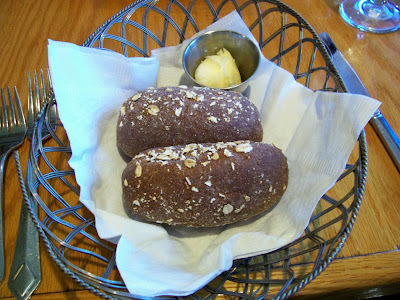 I am not criticizing, I in fact love this bread. I ordered the Trio of Crab. The server did not tell me this was going to be enough to feed four people. 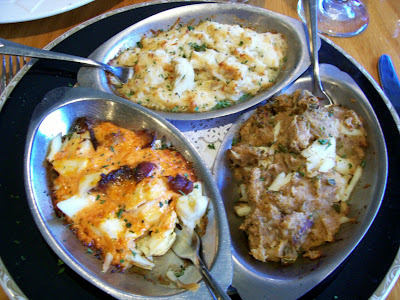 Going clockwise starting at the top we have Crab Royale, Deviled Crab, and Harlequins own Crab Remick. All the crab meat was a mix of jumbo lump and backfin, sweet and delicious. The preparations varied in their delivery. The Royale seemed to be an au gratin. 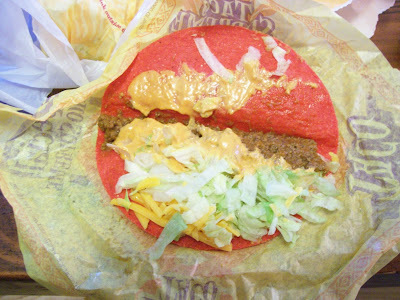 The cheese had separated so there was a watery component. All I got was the taste of a good parmesan which overpowered the crab. The devil in next dish was a spicy bread crumb mixture similar to a crab stuffing that had been overworked. The crab had been stirred in last minute and therefore was unseasoned and bland. The Remick however was fantastic. 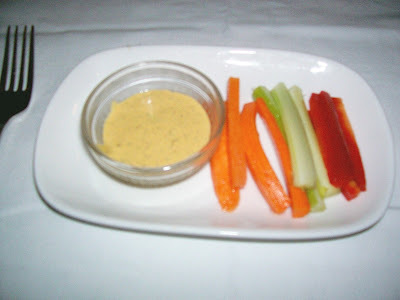 The russian dressing like sauce married well with the sweet crab. The ideal of opposites attract proven. 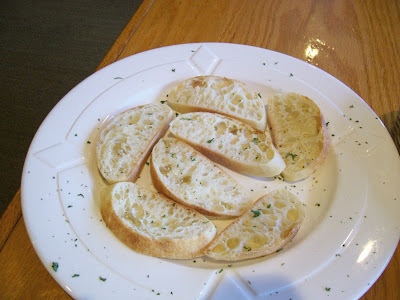 This dish came with crostini made from french baguettes to spread them on. The main event was a Burger with Home Fries. 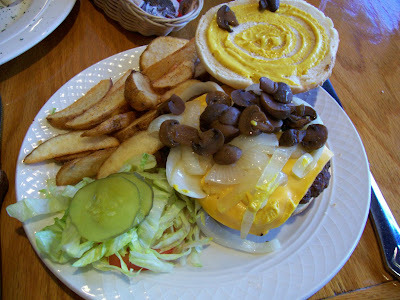 On a large hamburger bun bottom they start off with mayonnaise then a 8 oz or more patty cooked to taste topped with a slice of American cheese, sauteed onions, and sauteed mushroom topped with a mustard slathered bun top. Tomato, shredded lettuce and dill pickle slices reside on the side. Perfectly fried and seasoned wedge potato slices with tang ketchup made for righteous meal. Patty was juicy and meaty and the additions fresh. 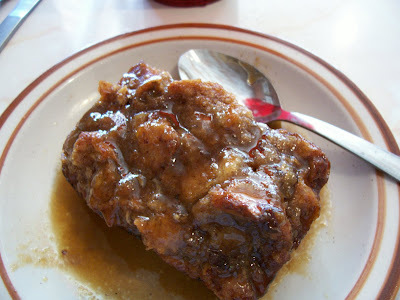 I finished up with Mrs Hunter's Bread Pudding with Lemon Sauce. A finely ground rather than torn in chunk bread pudding. Except for some Zante Currants a plain jane sort of affair which I prefer. The tart and sweet sauce set it off perfectly. 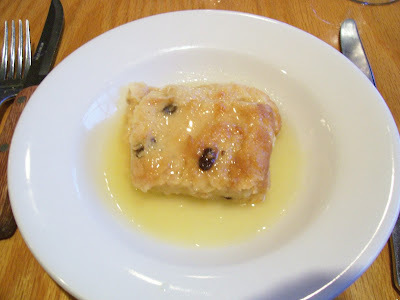 I have been eating this bread pudding on and off for nigh onto 40 years. This piece tastes as good as the first piece I had. An extravagance I admit but I need something to buck me up for the upcoming days. They do sandwiches with a wide range of soups, some salad, decent sides and plate lunch specials. 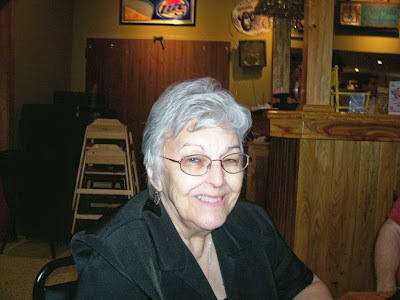 I will give you a link to the website later that contains a PDF of the menu. The owner is not only a chef but a bluesman to boot. On Friday and Saturday nights after cooking dinner for the crowd he doffs his apron and puts on his guitar. Then with his band plays away the night. Sorry I do not have the night menu but I ate there once and it was better than decent. There is a story or myth behind the Peacemaker. The story runs that a man in New Orleans was out late getting drunk. So on the way home instead of picking up flowers for his wife he goes to the local po boy place and get a fried oyster sandwich. Only in New Orleans would you bring home food to make the peace. Along side it is some Onion Crisps. 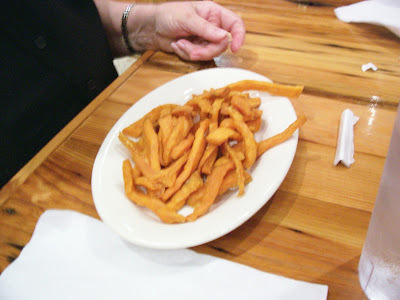 These are thin sliced onions soaked in a specially seasoned wash then coated with the corm flour based fry mix and flash fried. 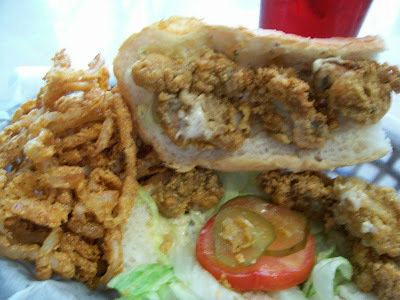 The oysters were excellent and some additional hot sauce made the po boy perfection. The onion were tasty and crisp but I prefer mine just coated in seasoned flour. That would have been the perfect combination for me however I would not throw this combo out the bed. 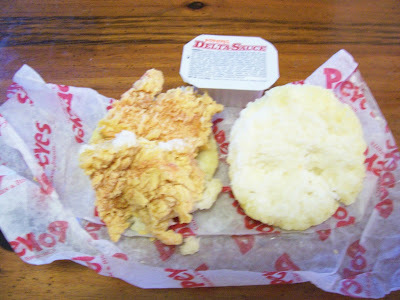 If you do not order a side you get a small bag of kettle chips made just outside of New Orleans. 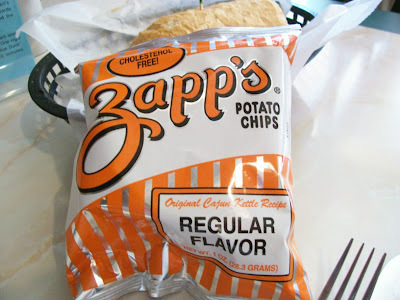 They are Ron Zapp's pride and joy. I finished off with bread pudding. Unfortunately not enough egg custard mixture had been used or they had not let it soak long enough. My piece had dry sections of bread and was very dense and dry. It did have a cinnamon flavor and looked great.